The Dairy Australia Award acknowledges the individuals, research and development in the dairy industry. It is a part of the Science and Innovation Awards for Young People in Agriculture, Fisheries and Forestry that recognises innovative scientific projects that will contribute to the ongoing success and sustainability of Australia's agricultural industries. The awards will be presented at the ABARES Outlook 2019 conference dinner on Tuesday 5 March. 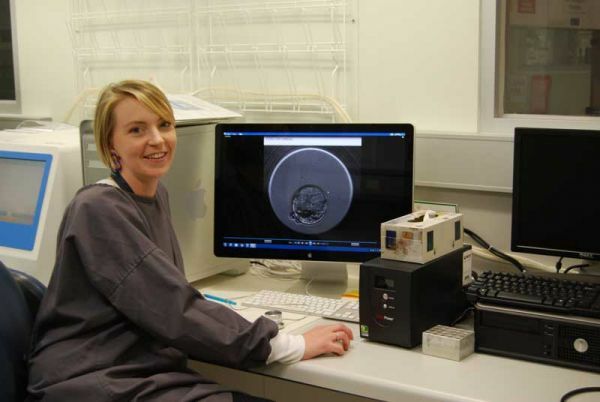 Bethany studied biology and genetics at the University of Melbourne, which led her to a career in embryology. She is currently a technical officer in reproductive biology. Having grown up on an orchard with sheep and cattle, Bethany never planned to go into agriculture but appreciates the direct application of her research. “I sort of ended up back where I came from” she laughs. Anne Watt, from the Faculty of Veterinary and Agricultural Sciences, has also received the Australian Pork Ltd Award from the 2019 Science and Innovation Awards for Young People in Agriculture, Fisheries and Forestry. She will also be presented her award at the ABARES Outlook conference in March.